I've seen this image going around on various aspects of social media lately, and more recently a friend shared it with me directly. I found myself rather immediately saying that I disagree with these rules, but it took me a moment to really figure out why. On the surface theses are things that I in general agree with. However, the specific wording of the rules seems to get my hackles up - and I dislike the order of them. It's not that these rules can't make for a good game, and that following them will prevent you from being a good GM, but there is a lot more to being a good GM than just these. Today I want to talk about that. In general I have nothing against this rule. RPGs are Games (it's the G) and games are supposed to be fun. A good GM should run a fun game. A good GM should allow fun to happen at the table. On the same hand, it is dangerous to believe that it is the sole job of the GM for fun to be had. The GM should create opportunities. The GM should be running a world where fun (for the players playing) can happen. However, the players have just as much responsibility when it comes to 'creating' fun as the GM. The other problem with this rule comes in because Rule 2 and 3 include the word "except where this violates rule 1." If the GM is 'bound' (these are rules, remember) to allow fun to happen, even if it requires inaction, then what happens when a player's fun comes from cheating? What happens when something thinks it's fun to steal everyone's stuff and to otherwise take actions that piss people off? Two big problems with this. 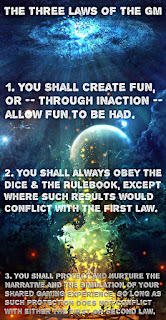 1) every rulebook includes rules that the rules can, and should, be discarded or altered as the GM feels should be done for their game to work the way they want, so this rule already is on shaky legs. 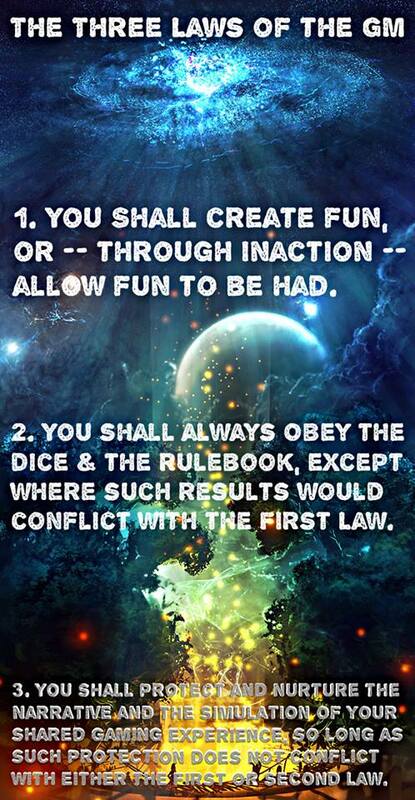 2) RPG rule books make rules by saying what you can do, not what you can't do. Almost all rules of what can't be done is from rule by exception which is problematic for things like this at best. For example, in D&D we know that most races can't fly because some races have a "flight speed" wwhich means they can fly at x speed. The rulebook doesn't really say anywhere that you can't fly unless you have a flight speed. Butit does say you can travel by flight if you do have one. However, - and before you call me on being a nit picker here, remember we're talking about rules lawyers having near ultimate power here - there is no rule saying you can't fly/hover/whatever without a flight speed. I'd be willing to bed there are some examples proving that above paragraph wrong, but in general it is how RPGs work. First off, what if my game isn't a simulation? Quite frequently I run High Fantasy stories, not realistic simulations. I am more concerned with narrative and drama than I am simulation. Second of all, while I get the exception about the dice leading the way, this steal leads to situations where PCs are protected from the consequences of their actions and otherwise can remove player agency. For example, if the player has made the choice to kill High Priest Valor - the maguffin needed to stop the evil tide from wiping out the land - do you still let the PCs stop the evil tide, or do you let them reap the consequences of their action? The shared narrative is one where the PCs save the world - only an action of the PCs is against that - and losing because you broke a key item you didn't realize was important isn't very fun. The point of this isn't to say these rules are bad. I more want to point out the problem with rules. Rules for being a "Good GM" are like any other piece of advice. Consume it. Chew on it. Consider it. Discard what doesn't work for you. Arbitrarily following rules will put you into a problematic situation. A simpler approach, in my opinion, would be to simply state that a good GM presents situations for the PCs to act in the world towards the stated goal of the game, has the world and NPCs react accordingly to the players actions, keeps the focus of the action on the PCs, and does what they can to preserve player agency. All of this should be done while trying - alongside the players - to have fun. However, if you can make 'fun situations' and respect player choices while presenting consequences, most games end up being fun on their own. Even if that means on occasion the dice, or rules, have to go out the window.